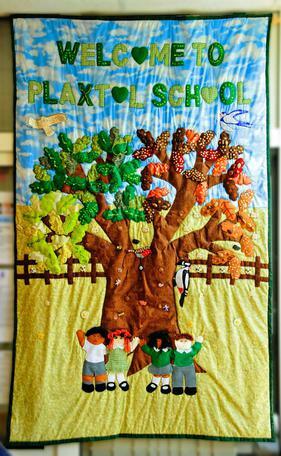 Welcome to Plaxtol Primary School. We are a small village community school set in the heart of the beautiful village of Plaxtol. Plaxtol is situated between Sevenoaks and Tonbridge, in an area of outstanding natural beauty and with a rich heritage. The school was originally established in the village in 1847 and since that time has offered the children from the village and the surrounding area a high quality education with strong links to the community. We strongly believe that providing the best education we can for our pupils involves learning together – school – family – community. The school currently has four classes and caters for children from ages 4-11 years. We can take 15 pupils a year into our reception class and in years 1 and 2; and up to 16 children in each of our other year groups. There are 93 pupils currently on roll. Our school has a friendly, family feel enabling all pupils to feel safe and secure. This allows all pupils to access their learning and develop to the best of their ability. All our staff and pupils know and support each other; our pupils mix freely across year groups which provides many opportunities for positive role-modelling both in terms of behaviour and communication. Our pupils benefit from a wide variety of curriculum enrichment opportunities both on and off site and also extend their learning through use of our on-site facilities, including our wildlife area, learning resource room and swimming pool. I hope this website gives you a comprehensive guide to Plaxtol School.